No meeting this month! Life is busy with holiday parties and travel. Stick to your plan! We’ll meet in person again in January. Meanwhile, tune in to TuneUps and connect digitally via our Facebook Group or forum on our website, the Community Boards. Put your marketing brain on, because we'll chat, catch up, and then go over how you are getting the word out about your business (or art, or book, or initiative). Enjoy Stumptown coffee and cheeses from Beacon Pantry. The Tin Shingle Member Mingle on the last Monday of the month, starting in September! Learn quick and easy techniques that your business can use today that will help more people find out about your business via this complimentary seminar. Designed for business owners who run a storefront, sell a product, or provide a service direct to customers, this workshop will get you comfortable with strategies in Facebook, Instagram, blogging and knowing what to do with your newsletter. 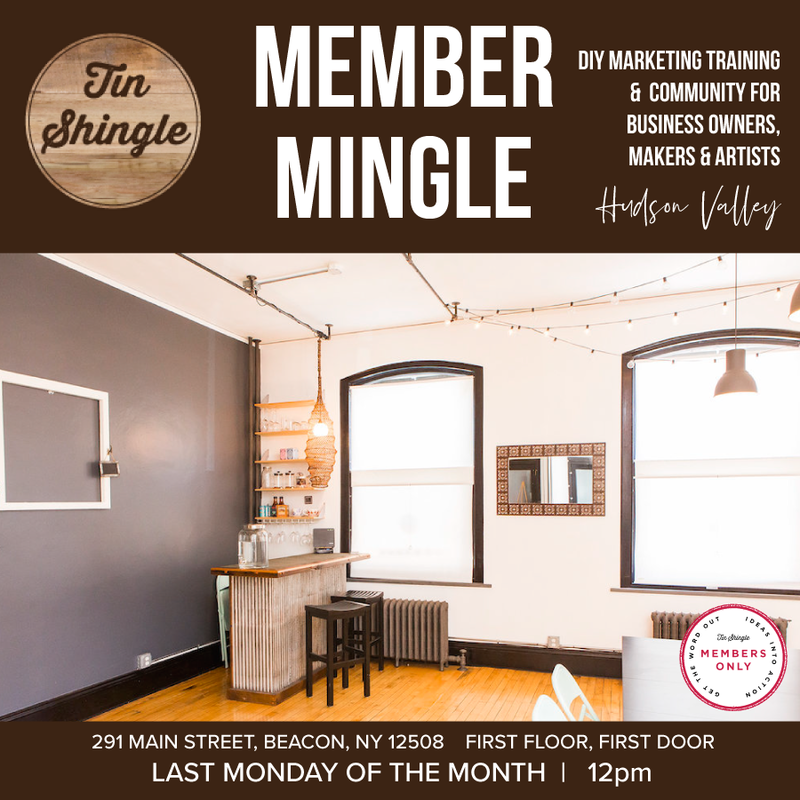 Once per month, on the last Monday of the month at 12pm, members of Tin Shingle are invited to convene at Tin Shingle's office to talk shop, marketing strategies, business growth, and connect with each other to ignite inspiration. Membership at the Community Level 1 is required. So go activate your membership if you haven't yet, and see you soon. RSVP: Please click here to let us know if you're coming! RSVP: Please click here to let us know if you're coming. The Cupcake Festival is coming to Beacon! Are you ready? Facebook's privacy profiteering may be coming to an end, which could change Facebook ads, as well as how often people are on Facebook. What's your backup plan for reaching people quickly? In this class, you will go through the process to get you started on your website. Start with a blank slate, end with knowing what pages will be on your website. We will use blank pieces of paper, colorful markers, dry erase boards, and other easy ways to break you free of your fear of creating the website. For Business Love During Valentine's Day, this Member Meeting is Open to Everyone! It's an Open House. Tin Shingle's Member Meeting will happen on the last Monday of every month, and will be used to help prepare your PR Planning for the next month. Connecting business owners, artists and makers is so important to us, because when we come together, fresh ideas fly, you begin to think bigger, and come away with new visions and strategies to help your business grow. This hour-long meeting will be several parts. Indulge in this session of talking shop with other like-minded business owners who share several of your challenges and triumphs. Workshop: Bring the magazines you want your business to be featured in, because we will all be doing our homework by clipping ideas, writers and editors to follow up with for a fresh PR pitch. Brain Picking: If there's an expert in the room, you can pick their brains! We know that Tin Shingle's owner Katie will be there, which means you can ask your questions about SEO, Social Media, Business Strategies, and PR. Idea-ating: Through all of this, you're bound to come up with new ideas to tackle this week or month. Looking forward to hearing them! Attendees must be members of Tin Shingle at the Community Level ($45/month), which is commitment free, and is a subscription you can upgrade or downgrade at any time. All other membership levels are able to come. Click here to learn about and start a Community Level membership. Join us for our first live interview with Jenn Sullivan, founder of Waddle n Swaddle. We will talk to Jenn about expanding her stores to three locations, managing staff, and life as a business owner with three kids. This event is free, but seating is limited. RSVP to info@tinshingle.com if coming in person. Register for the online Webinar to watch it online.